Colored Lithograph of Robert E. Lee by Bradley & Co. These large, colorful chromolithographs were sold after the Civil War to help finance the building of the Robert E. Lee Memorial at Washington-Lee University. They are extremely well-drawn and look great in the old, early Victorian frames which hold them. Due to their large size, they are impressive. Robert E. Lee was most beloved of all the Civil War generals, being revered even-after the conflict by Southerns. Even Grant did not attain such warm stature of emotion. Lee died in 1870. A matching piece of Stonwall Jackson was also sold at the time. Because many were snapped-up by the public when first sold, these images still surface on the modern antique market. This is a nicely drawn and colored lithograph from Valentine's Manual of New York City in 1864. It shows the Soldier's Depot Building which housed and cared for returning sick and wounded troopers. Numerous large cities set up stations or depots to feed, house and console returning troops. The Civil War was a time when church & community efforts in behalf of troops often superceeded the effectiveness of those in place by a newly evolving military system of hospitals and ancillary services. Honorary Certificate for a Soldier Later Killed!!! During the War, lithographers put out many colorful lithographic sheets honoring both the living and dead. The most famous company was Currier & Ives in New York City. However, this "Army Diploma", copyrighted in 1863 by Gibson and Company and then published by McMullen & Gates of Cincinnati is just as stunning in design. It is a form of commendation or testimonial given out DURING the Civil War, attesting to the bravery of one Isaac Van Vorus from Company A of the Twelfth Regt. Illinois Infantry. He fought at the "Battles of Donelson, Shiloh, Siege of Corinth, and Corinth (October 3rd and 4th 1862). This was ink written by Washington Van Horn, his 1st Lieutenant. Despite a few slight water-stains and tiny tears, the colors are still vivid. 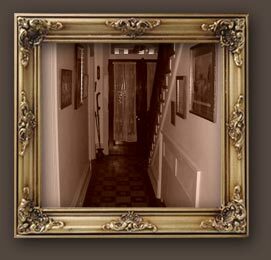 The picture is still housed in its plain Civil War period gold frame. A search of Civil WAr Databank Records reveals that Issac resided in Caledonia, IL, and was mustered into "A" Co. IL 12th Infantry on 9/17/1861. He saw fit to re-enlist on 1/1/1864 but was killed-in-action at Allatoona, GA on 10/5/1864. No doubt his family kept this hung with a bittersweet pride upon the walls of his home when he did not return. This is a nicely made chromolithograph from D.T. Valentine's 1864 Manual of New York City. It shows where wounded and sick soldiers were housed in the NYC Soldier's Depot (4th Floor) Hospital Ward for the ill. One can see many period items, such as the gas chandeliers, the coal stoves, transomes in doorways for ventilation, and many windows for use of natural lighting. A doctor visits a patient while a sergeant walks nearby with crutches. Note the adjoining medication or apothecary room... This is the type of multi-colored registered lithography that sprang up just prior to CW and was made most popular by Currier & Ives at the time. Image is about 5 1/2" by 8". 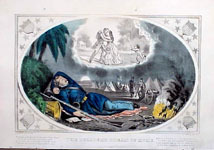 This is an 1862 lithograph by Currier and Ives of a woman at home dreaming of her husband leading a battle charge. Has verses: "Ever of him who at his country's call, Went forth to war in freedom's sacred name, She thinks in waking hours: and dreams are all, Filled with his image, on the field of fame/ She sees her hero foremost in the fight, Bearing the glorious banner of the free; Triumphing o'er the traitors boasted might, Then home returning crowned with victory." 9" by 12 1/2". Currier and Ives were already successful at selling Lithographic scenes of popular daily themes for framing on walls of homes. With the start of the Civil War, they produced images that demonstrated bravery, sorrow, patriotism and loneliness. Wives were expected to "be brave." This is from 1861. Actually, this is "Saving Private Grate," a 19-year old who served with the 104-th Ohio Infantry through much of the Civil War. I recently obtained an ambrotype of eager young Curtis in uniform holding his musket "at arms". However, to my surprise, I discovered two curious rolled sheets of thick paper tossed in the bottom of the shipping box. (?) Lo and behold, when I spread them out, they were Grate's lithographic post-War "Testimonial" sheet which recounted his Civil War service in colorful detail. Formerly, this dazzling document was likely displayed in the old soldier's home. But, over the ensuing decades it was taken down and tossed in an attic or basement. Now, the sheet was torn in half, covered in yellowed Scotch tape strips and even missing small sections. I sat for a minute wondering what I would do with this unexpected arrival: a) to store it, b) to toss it out, or c) to spend many hours trying to restore it. As a dealer, there was no money in fixing-up such a torn, tattered post-War document... However, as a history buff with a soft-spot for real personal stories from our past, the answer was clear! "Just Do It!" I sat down, unfurled the two halves, and carefully realigned them onto an acid-free foam board. Fitting in little fragments from the bottom of the box was like working a jigsaw puzzle. Lastly, I spent long evenings carefully using fine colored markers to touch-up numerous cracks, scuffs and empty holes. With the project completed, I feel a real deep satisfaction. I have helped to save this memorial to a proud, young American warrior: Curtis Grate. I will place it in a fancy old frame and hang the soldier's ambrotype photo beside it in order to lend a real face to our American Heritage. In this crazy world, we can't lose sight of our heroes, both past or present. And Curtis surely walked the walk. This is an Albumin of an identified Civil War soldier that had had tinting with pastel done over the foundation of the photographic image. These "enhanced" photographs were done both during the Civil War and afterward upon copies of war-dated images in order to add color and vibrancy to the sitter's face and uniform details. They were hun in homes of proud veterans and later their descendants to show the now retired brave warrior in his days of glory. This image shows a plain young lad looking intently at viewers with wide blue eyes. His cheeks, hair & lips are lightly hand-tinted. His blue porkpie hat bears a yellow infantry hunting horn device. Buttons are yellow (gold) and frock coat blue. There are some scattered blue ink-like stains in background above his head, possibly from water causing inks from adjacent paper item to run under moist storage conditions. These could be cleaned away in future by a paper conservateur if you wanted. But thankfully, there is no mold damage or rot to albumin or mount card. So this historic image is stable. It's sizes are: Image (4 3/4" by 3 1/2") on a paper sheet (9" by 6 1/2") glued to its original mount card (10" by 8"). On back of mounting cardboard is written in pencil "A. R. McGill 141 N.Y. Vols." Data Bank tells us he was 27 years old, enlisted 8/22/62 at Howard, NY. Promoted to Corporal 1/1/65. Mustered Out 6/8/65 in Washington, D/C. So, he survived the war to tell his stories around the fireside.